Being over 400 feet above the ocean, the views from Cabrillo are marvelous, overlooking the Pacific Ocean to the west and San Diego Bay, Coronado, the airport, and Downtown San Diego to the east. Mexico and several off-shore islands are also visible from this vantage point on a clear day. Being over 400 feet above the ocean, the views from Cabrillo are marvelous, overlooking the Pacific Ocean to the west and San Diego Bay, Coronado, the airport, and Downtown San Diego to the east. Mexico and several off-shore islands are also visible from this vantage point on a clear day. 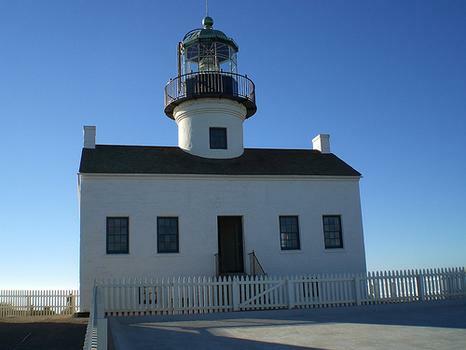 A short walk from the parking lot is the Old Point Loma Lighthouse, which was built in the 1850s to warn approaching sailors of rocks. However, the location proved poor and a new lighthouse was built closer to ocean, leaving the old lighthouse empty. Today the old lighthouse has been preserved and is open to tour. Each year, on the lighthouse's birthday, the top of the lighthouse is opened for visitors to enjoy the same view that the lighthouse keeper had.